Twitter is an online social networking service that enables users to send short 280-character messages called tweets. According to recent social media industry figures, Twitter currently ranks as one of the leading social networks worldwide based on active users. 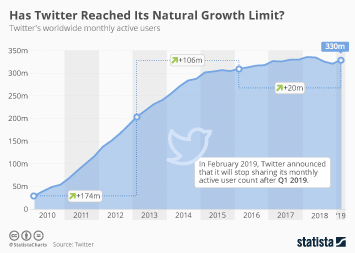 As of the fourth quarter of 2018, Twitter had 321 million monthly active users. During the same period, the number of monetizable daily active Twitter users worldwide stood at 126 million. Registered users can read and post tweets as well as follow other users via update feed. As of February 2019, Katy Perry was the most-followed celebrity on Twitter with almost 107 million followers. In 2018, the company’s revenue amounted to 3.04 billion U.S. dollars with a net income of over 1.2 billion U.S. dollars. The majority of company revenues are generated via advertising. The company went public in November 2013 and is ranked as one of the largest U.S. internet companies with a market capitalization of approximately 30 billion U.S. dollars as of June 2018. Twitter has consistently been named as one of the most popular social networks of teenagers in the United States. However, in recent survey periods, the social network has lost most of its market share to mobile competitor Instagram and more importantly, Snapchat. Recent social media data also proves that Twitter usage is becoming increasingly prominent during events. Live-tweeting happenings such as sporting events or television airings has become a popular way for consumers to engage online with others while sharing their thoughts on current experiences. According to industry measurements, TV series such as AMC’s The Walking Dead or HBO's Game of Thrones are currently ranked amongst the most popular television series online, based on their Twitter online buzz per episode and Twitter audience size.